“Don’t worry! I am here for you. 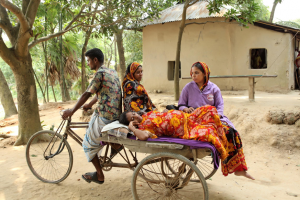 You and the baby will be fine!” assured Momotaj Begum (35) holding pregnant Fatema Khatun’s (24) hand as they were on their way to the hospital. A deadly fire broke out in Dhaka’s Korail slum at 2:45am; leaving more than 3000 people homeless. Momotaj Begum’s family was among the several affected in the fire. Upon ensuring safe shelter for her own family the first thing Momotaj did at dawn was check on Fatema in the fire-affected area- who was in the final week of her third trimester. Fatema’s family lost their home in the fire and were left with no roof, money or food. When Momtaj finally found Fatema, she was lying on the ground under the open sky; unable to breathe properly. She had two children who were sitting beside, in tears, praying so that their mother won’t stop breathing. 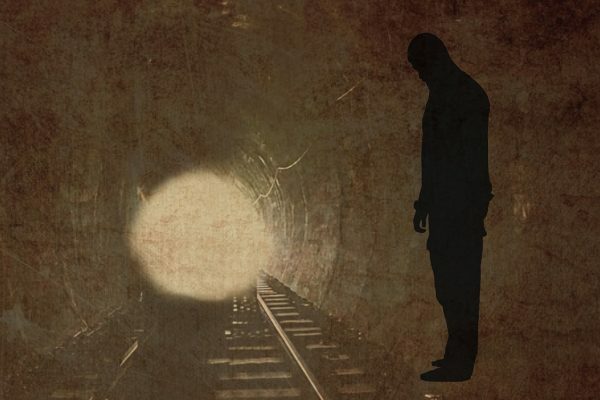 She had inhaled excessive amount of smoke, her situation was deteriorating at a fast pace. Her husband who was a rickshaw puller met a road accident two month ago which resulted in a severe leg injury leaving him unable to walk without crutches. He has been crying for help but the whole neighborhood was in chaos after the disaster that has happened. Momotaj immediately gathered help, took Fatema to the nearest government clinic and ensured that necessary steps were taken to restore her health so that she can undergo risk-free delivery. The following week, Fatema gave birth to a healthy baby through a risk-free normal delivery process. Today the baby is 2 years old; the mother and the baby both are leading healthy lives and receive regular visits from Momotaj Begum for health counselling and routine check-ups. Had Momotaj not taken immediate action to check on Fatema two years ago after the fire broke out; both Fatema and her child could have been one more number added to the statistic of 7,700 maternal deaths that Bangladesh witnesses every year. Despite being affected herself in the slum fire, Momotaj went to check-on Fatema amidst the crisis situation. Momotaj Begum is just one example out of the many BRAC community health workers who are gatekeeping maternal and child health in their respective communities, alongside ensuring essential healthcare for the poor, day and night, everyday- regardless of social, political, natural or man-made disasters. Momotaj Begum (35), a Shasthya Kormi (SK) of BRAC HNPP working at Korail slum who took Fatema to the clinic after the deadly Korail fire in 2017. There are many such unsung heroes behind the health index progress of Bangladesh over the past couple of decades. These heroes do not come with capes, neither can they fly; their superpower lies in the fact that they are ‘from the community and for the community’. To them, their beneficiaries mean more than just a client. 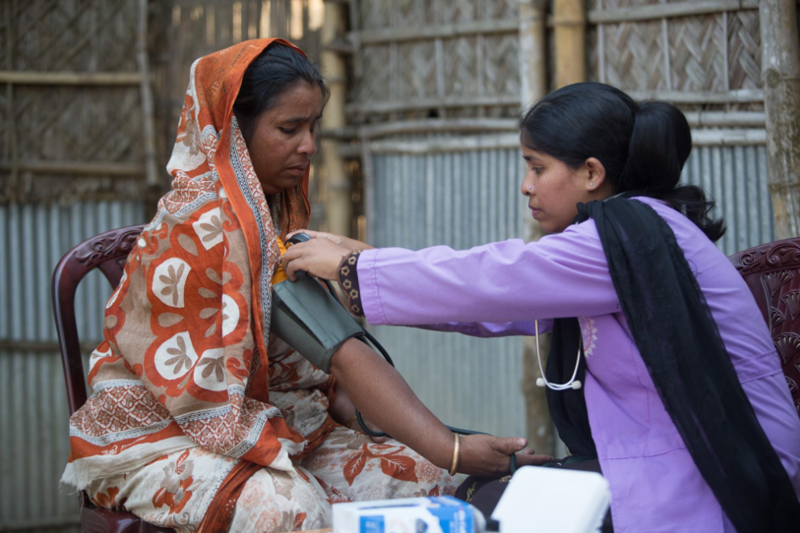 Even in the most unstable of situations- be it political unrest, fire break-outs or natural disasters- our community health workers have stood in the frontline to ensure health and wellbeing for the underserved population of Bangladesh since 1970s. From going door-to-door to teach mothers how to make oral saline in order to prevent child death caused by diarrhoea, to immunizing children, facilitating medicine course completion of identified TB patients, or ensuring risk-free delivery for pregnant women; BRAC community health workers (more popularly known as Shashthya Kormi and Shashthya Shebika) have been at the forefront of safeguarding healthcare needs of their community members. They have adapted new techniques, managed crisis situations and served as per the community’s need; saving millions of lives every year. Shasthya Kormi (SK) and Shasthya Shebika (SS) conducting yard forum in order to discuss and raise awareness about adolescent health and reproductive health. BRAC health, nutrition and population programme stands tall as the hub of world’s largest community health worker network. 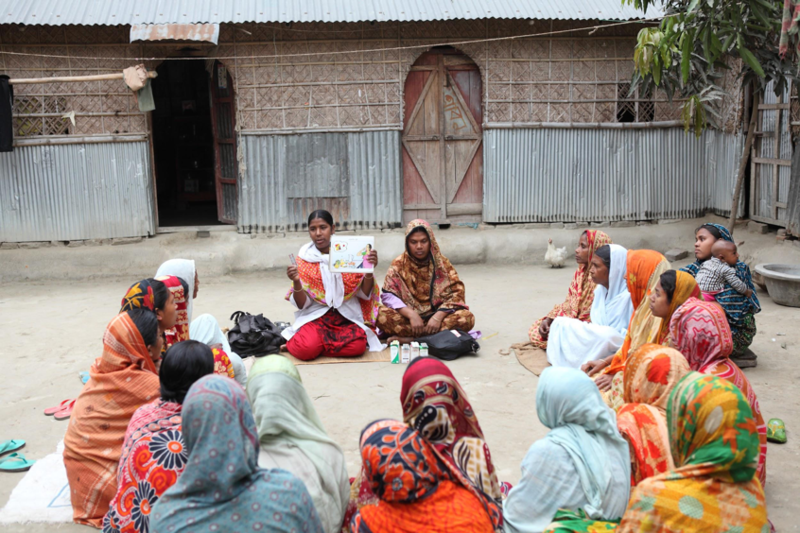 At BRAC, we reach at the doorstep of 110 million people across Bangladesh through a trained cadre of 50,000 Shashthya Kormi(s) and Shashthya Shebika(s). Our community health workers provide services to the community by promoting preventive, curative, rehabilitative and referral support. They offer health education and counselling to the community, creating a pathway to promote behavioural change for a healthy lifestyle. Our community health workers provide an array of essential healthcare services including antenatal care, postnatal care, delivery care, adolescent healthcare, maternal,child nutrition and immunization. We also provide screening, primary treatment and awareness about basic communicable and non-communicable diseases. However, we do not just stop at primary healthcare. BRAC currently runs a nation-wide medical referral system, where our community health workers identify cases in the community that needs specialized support, and connect patients with appropriate government and non-government health service providers. BRAC’s community health workers give a holistic support to the healthcare needs of the community. Beside screening, basic treatment and referral support they also conduct health, nutrition and hygiene educational sessions for community members – ensuring prevention before cure. Furthermore, our health workers also act as a one-stop service provider for the community making basic health, nutrition and hygiene commodities available to the community members at an affordable rate (e.g. sanitary napkins, safe delivery kits, contraceptive pills, condoms, reading glasses, micro-nutrients). However, our community health workers do not limit the scope of their work only to delivering the services to people. They also complement the existing community systems to improve on the go. For example, our Shashthya Kormi(s) were strategically able to break through the syndicates of traditional birth attendants in urban slums ensuring more and more women receive support from skilled birth attendants. Moreover, they engaged the traditional birth attendants in midwifery trainings in order to turn them into skilled birth attendants. Hence, solving the problem of risky delivery by traditional birth attendants in many urban slums from the very roots. Another embedded activity of our community health workers that often goes unnoticed is how they utilize this vast nationwide network and identify persons with disabilities to be referred to appropriate affordable facilities for specialized support. For example, many persons with visual impairment are referred to BRAC vision centres on a daily basis where they receive treatment at a minimal expense. Whereas, many persons with other forms of physical disability (referred by our community health workers from all over the country), have been receiving rehabilitative support from BRAC Limb & Brace centres since the year 2000. Our superheroes do not wear capes. They are your regular woman next door with a not so regular commitment towards ensuring quality healthcare for the people in their community. May it be a devastating flood or a deadly fire, day or night, you will find our community health workers, our unsung superheroes, silently but relentlessly serving the underserved people in the community with their uncompromising integrity, inclusiveness and effectiveness. 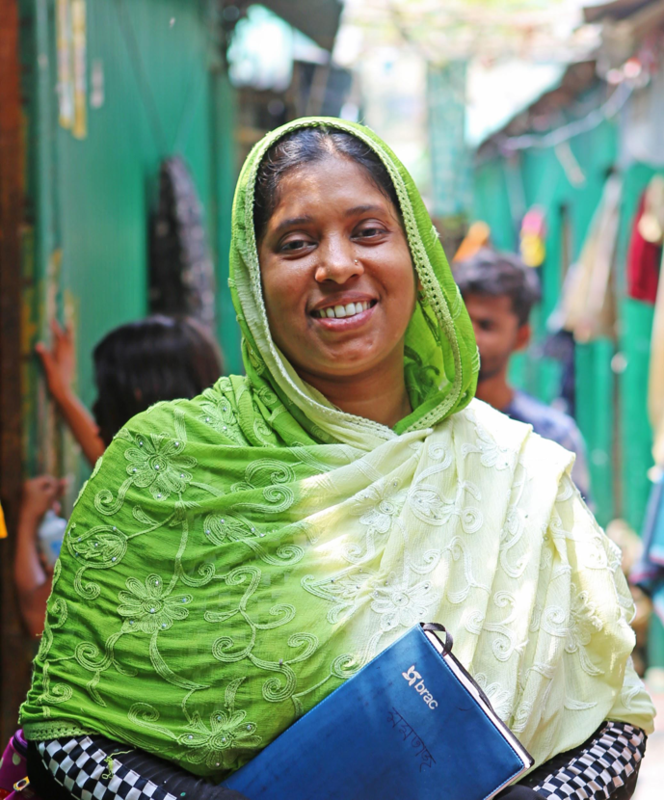 This Community Health Workers Week, on behalf of Bangladesh – BRAC thanks the thousands of community health workers across the country for never giving up on Bangladesh. Sanjida Afrin is a Young Professional Trainee in BRAC’s Health, Nutrition and Population Programme and Tanjila Mazumder Drishti is a Senior Manager in BRAC’s Health, Nutrition and Population Programme.